When I purchased my '7' from Mrs. Margaret Price in September 2003, I made a promise, and that was that I would show Margaret, and her husband Tony the car once it was back to life again and 'on the road', having been stored for many years. How quickly time flies when you are enjoying yourself. 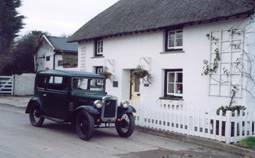 And so, eight months later, one evening in May 2004, I returned the car to Quay Cottage, Devoran, very pleased with the result of my refurbishment. It was a delight for me to take Margaret for a ride in her once treasured 'baby'. Soon her history (the car, that is!) started to unfold. As a young teacher of special needs children, Margaret needed a car to transport her work and equipment to and from schools. Having heard of the Brands Hatch Auction, she went with some cash in hand, looking for a suitable purchase. Up for auction came a green Austin Seven. The 23 year old was as 'green' about cars as the car itself! However, she tells me, it was love at first sight. Although, body wise, it was in a sorry state, she was a runner. There was keen bidding, and at £220, £10 over her budget, Margaret clinched the deal. Following a refurbishment of the mechanics, what was left became the challenge for the young teacher whose only practical qualification was in sewing. Buying a spray-gun and Westminster Green paint, and the necessary materials for renewing the interior, the work was undertaken and completed. Thirty five years later the paintwork remains good. It's surprising what you can achieve when you try! However, one last coat of paint on the rear wing went wrong. Margaret said she was rushing! So that's what went wrong - I had noticed it! The green '7' which Margaret called 'JOAN', after her children JO-nathan and AN-thony, gave so much pleasure. And that was why it was such a delight for me to go down memory Lane with Margaret. Following the sale, it was very kind of Margaret and Tony to make a donation to the Club in appreciation of the Club's support. The car that gave Margaret so much pleasure is now giving me pleasure as I drive in the locality of Porthleven. So if you see JN 4618, now you know part of it's history. This article, written by Winston Thomas, originally appeared in Seven Focus Oct 2004 p23. Winston sold his Seven in July 2011.